A man turned himself in at a police station about two hours later, police in Sagamihara said. He left the knife in his car when he entered the station. 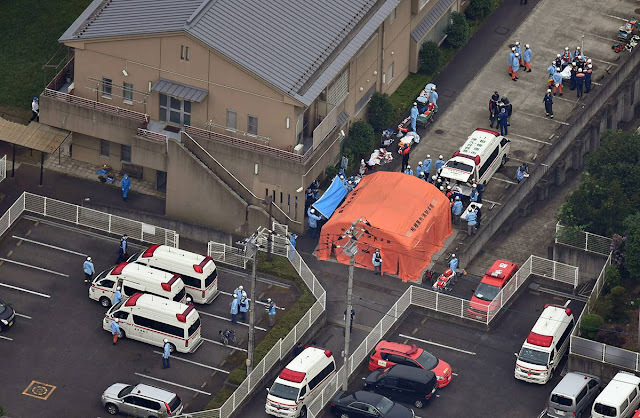 Officials in Kanagawa prefecture, which borders Tokyo, identified the suspect as Satoshi Uematsu, and said he had worked at the facility until February. Japanese media reports said he was 26 years old. The Sagamihara City fire department says that 19 people were confirmed dead in the attack. The fire department said doctors at the scene confirmed the deaths. "I was told by a policeman to stay inside my house, as it could be dangerous," she said. "Then ambulances began arriving, and blood-covered people were taken away." Mass killings are relatively rare in Japan, which has extremely strict gun-control laws. In 2008, seven people were killed by a man who slammed a truck into a crowd of people in central Tokyo's Akihabara electronics district and then stabbed passers-by. In 2001, a man killed eight children and injured 13 others in a knife attack at an elementary school in the city of Osaka. The incident shocked Japan and led to increased security at schools. "I never imagined such a horrible thing happening," said Chikara Inabayashi, who was tending his watermelon patch. "I was astonished, that's the only thing I can say."